Rockies is a good stopping off bar found just inside the Odyssey Pavilion. There is a pool table inside, plenty of seats also alot of standing space. Have you got Google Earth on your computer? If so, then download the Google Earth view of Rockies. Is this the wrong position for Rockies? If you think so, then modify its position. Click / Tap the button above to get directions from where you are to Rockies. It's a good wee bar to go for a drink before or after a concert. They also show football and other sports. Drinks are a bit expensive though. Also the place could do with a bit of a clean up. I sat on the padded seats over to the right of the bar, near the windows, and the one I sat on was completely ripped and was half covered over with tape. It wouldn't hurt them to give it a bit of a going over. Was here on Saturday night before i headed to the Box, great wee bar only bad thing i can say about it is that the drink is very expensive. Yeah its a place you go to before you head to the clubs in the odyssey its not a bad spot worth a go before you head to the clubs. 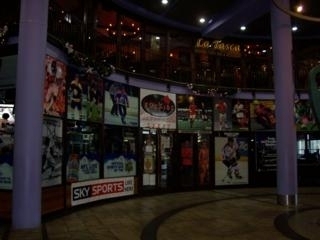 Great bar, Good place to start off from b4 you go to any off the clubs in the odyssey. Worth a try! Disabled Facilities Wide door, ramps and disabled toilets.